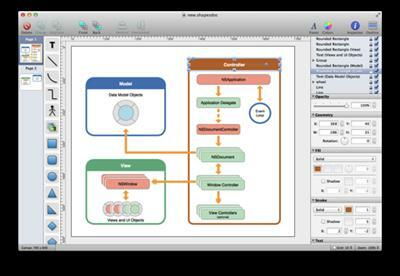 Shapes is an elegant Diagramming app for Mac OS X, that is both simple and powerful. Shapes gives you all of the most important features you need in a Diagramming tool without all the extra cruft. Shapes is great for Programmers and Web Designers looking for a simple tool for quickly designing Charts, laying out Wireframes, or visualizing Model Relationships. Shapes lets you get to work quickly by giving you just the important tools you need in a slick, single-window, thoroughly Mac-native UI. Shapes also includes full support for modern Mac OS X features like Quick Look, Full-Screen Mode, Autosave, and Version Browsing.